Burleigh Heads businessman, Darryl Essington-Wilson from Gold Coast Family Car Rentals, is set on keeping the tourism wheels turning even faster. Darryl says he’s got plenty of wheels to turn. Burleigh Heads, Australia – October 9, 2018. 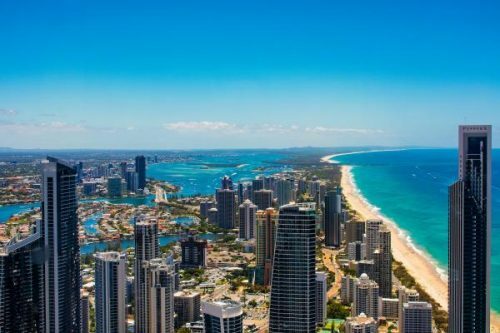 The tourism boom has pushed the Gold Coast to second place in the TripAdvisor’s top 10 rankings of the most popular places in Australia and it’s showing no sign of dropping its momentum anytime soon. Burleigh Heads businessman Darryl Essington-Wilson is set on keeping the tourism wheels turning even faster. And, as CEO of Gold Coast Family Car Rentals, he’s got plenty of wheels to turn. Darryl said that the surge in tourism held both challenges and opportunities for Gold Coast businesses and service providers. And it would certainly impact on the car rental sector in particular, because of the intrinsic link between tourists and the need for temporary transportation. The well-established car rental company proprietor said that if handled correctly, with integrity and a service mind-set, tourism and the service sector would both benefit and continue to grow. The Gold Coast is still around 2million below Queensland’s capital, Brisbane, in both the domestic and International tourism tables in 2017. However, its rise in popularity indicated by the TripAdvisor. In the traveller-rated Top 10, Gold Coast topped the capital by two places. And this despite it’s being home to a population less than a third of the size of Brisbane’s. The latest statistics set domestic overnight visitors to the Gold Coast during 2017 at over 8 million. Just more than 2 million of those were intrastate overnighters from within Queensland. A further 8 million day-trippers, and over a million international tourists, also took the opportunity to take in the sights and sounds of the Gold Coast experience. And that was before the 2018 Commonwealth Games pushed the numbers up still further with an estimated visitor boost of around 600,000, and sales of more than a million tickets. The only sector to see a percentage drop in figures was the domestic day trippers, who dropped off by 6%. However, this was overset by a 30% increase in overnight intrastate visitors. Darryl said that this could indicate longer stays during the 11-day Commonwealth Games period, followed immediately by school holidays, feeding a desire by intrastate visitors to stay longer in the Gold Coast area to enjoy its popular attractions. The area is, after all, known for its surf and beaches, night life, shopping, and theme parks, and for the natural areas within easy reach of the city. Darryl also said that a hallmark of both International and Interstate visitors to the Gold Coast is that they regularly repeat their visits, some several times a year, some annually and others bi-annually or similar patterns, leading him to be confident that last year’s 6% drop will quickly be corrected. The car rental service expert said that car rental offered the perfect solution to DIY exploration of the area. It enabled overnighters and short-term visitors to choose their own destination, and decide just how much time they would spend in one place. This was particularly relevant to those who flew in from other centres for a short stay, as time was of the essence and an organised tour might lead to their spending too long at a place which didn’t catch their interest, and too little time at another which they found more attractive. If you are looking for a car rental in the Gold Coast area, particularly from Coolangatta to Surfers Paradise, and including the Gold Coast Airport, visit Darryl’s website Cheap Car Hire Gold Coast and Gold Coast Airport Car Rental to get an online quote or book online.